For today’s contest, who can identify these classmates? 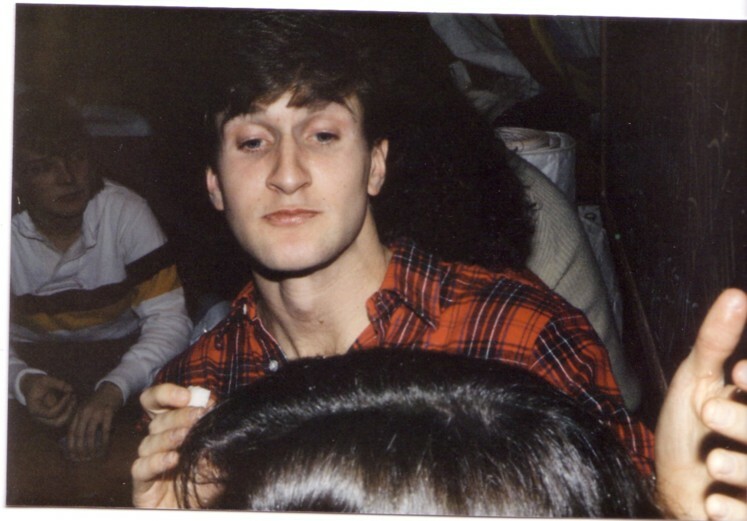 I can’t tell whose head that is or what Rob Chase is doing holding a sugar cube. I am fairly certain that the location is Carter House and that George Tolley’s then-girl-friend-now-wife Kirsten is in the left background. Anyone with further details should let me know . . . Nevertheless, I also submit to you that increasing the diversity of the student body contributes to an increase in relative yield — I can’t prove that, but I would cite the arguments in the much-publicized (and yet-to-be-decided) University of Michigan admissions cases, including the argument of the U.S. military in favor of considering race in admissions — you don’t take issue with the position of the military, do you Dave? I agree that diversity helps Williams, both by increasing the relative yield and by improving the quality of the education that is provided. I would not want my daughters to go to a College at which everyone, but them, was the same color as George’s sons. However, because ability (as measured by test scores, high school grades, application essays and the like) is not only found among the pale, Williams would be a thoroughly diverse place even in the absence of affirmative action. Imagine a world in which all applicants are judged on merit. Do you think everyone at Williams would be WASP? I don’t. In fact, I think that the non-WASP proportion at Williams might be more or less the same. There would be changes, no doubt. But how different would Williams really be? Affirmative action in the military, to the extent that it has relevance to Williams, is mostly misportrayed in the media. First, 95% of the members in the military are unaffected by it. Anyone who succeeds in becoming, say, a Gunnery Seargent in the Marine Corps, is there independent of the color of his skin. You rise (or fail to rise) to that station on your merits. Second, those few who are affected (mainly in admissions to the service academies and, on the margin, in certain schools like flight training) are treated very differently that Williams treats its own affirmative action admits. Although this is a complex topic, perhaps the most relevant analog to Williams are the service academies. Although they do practice affirmative action (i.e., admit applicants who would have been denied if they had been white), they prepare most of those applicants by giving them an extra year of classes and instruction prior to enrollment. Anyone who thinks that this approach has a connection to Williams should explain why Williams doesn’t (or shouldn’t) do the same. In any event, George and I agree on the most important things. First, relative yield (and its change over time) would be an interesting statistic to look at. (Williams’s relative yield is almost certainly much higher now than it was in the 1950’s.) Second, the most important measure of success for the college is how better off (in mind, body and spirit) Williams graduates are relative to their status had they gone somewhere else — although this is very hard to guess at, much less measure. Third, that our children (as pure-blood Ephs) should receive significant preferences from the admissions office when the apply. Actually, I don’t know if George agrees with this last one. Speaking of candid shots, here are a couple from the fall of 1954. 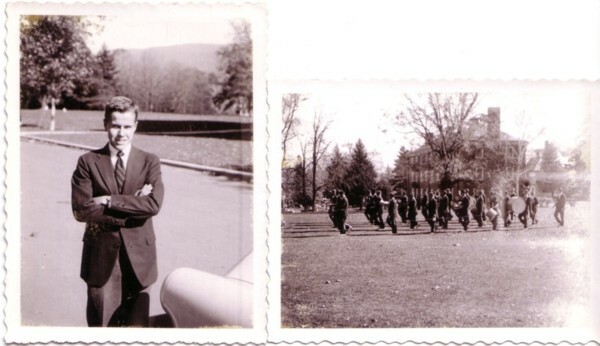 My father, class of 1958, seems to be standing by Williams Hall. The marching band, of which he was a member, seems to be warming up or practicing by West. I am not sure if they called it the Mucho Macho Moocow Marching Band then, but I am certainly a fan of almost every WIlliams insitution that has survived for more than 50 years. Certainly, the band commentary, both when we were at Williams and at the football games that I have attended recently has been some of the most snappy and witty writing at Williams, if, of course, you have a taste for this sort of stuff. Try as I might, I am having trouble convincing people to send me more pictures, both current and historical. Say what you will about my politics, however, I am not without resources. In honor of her birthday, here is a photo of Julie Cranston, walking in the Freshmen Quad (do they really call it the First Year Quad now?) 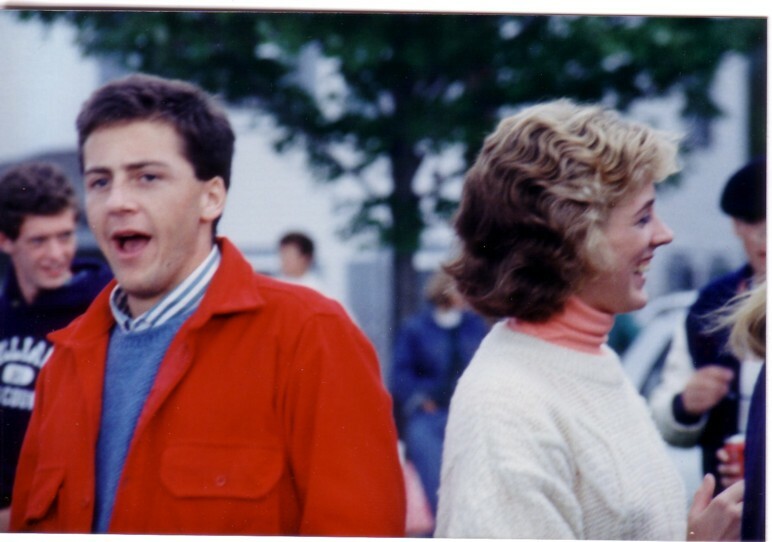 with Lisa Klem sometime in the fall of 1984. Did I mention that I was quite the amatuer photographer during our time at Williams? Do you know how many of these candid shots I have? Please don’t risk the unknown. Send in some photos. We promise to scan them and give them back to you at the reunion. Best: Find Balance. Play hard, study hard, but avoid overdoing either. Make sure you try new things and explore your new surroundings, but keep yourself grounded in who you are and who you want to be. While your college days will be among your best, they are only four short years. Worst: “Don’t worry about choosing a major, you have plenty of time.” In reality, if you wish to study abroad for all of junior year, you’ll have to finish a decent chunk of your major requirements before the end of sophmore year. So, try new things, but keep your eye on the ball, you need at least eight courses in a single major to graduate. If you’re going to stick around junior year, you’ll have more flexibility. Would any of our readers have another take on the topic? One topic that is near and dear to many of us is that of Eph/Eph marriages. Statistician that I am, I used to tabulate the marriages in each issue of the Alumni Review. For the most part, 20%-25% of all alumni who marriages were reported in the Review for classes after 1980 or so were married to other Ephs. The proportion seemed to be higher for later classes. Of course, intra-Eph (inter-Eph?) marriages are much more likely to make it into the Review, so I would say 20% would be a fair estimate. I would suspect that the new housing lottery would raise this, but that is speculation. I would wager that the 40% figure cited is wildly off the mark, but I remember hearing similarly high estimates while we were undergraduates. Higgins II M.D., Thomas F.
along with 19 other adults, 32 kids and one babysiter, our projected attendance is at 81. Come join the party! My fellow bloggers Tracy and Kim will be trying to provide as much information about these early adopters as we can. Basic idea is that we would like as many people to attend the reunion as possible and that the main reason why you would want to attend, leaving aside the purple mountain majesty, is to see your classmates and their families. It is Julie Cranston’s birthday! It is Julie Cranston’s birthday! If I had her e-mail address, I would pass it along so that you could all send congratulations. Comments Off on It is Julie Cranston’s birthday! The more than 500 members of the Class of 2006 arrived on the same day, which taxed the infrastructure of buildings and grounds, security and other service staff. Academic departments had to be up and running sooner than usual. But the entire community rose wonderfully to the occasion. For the next three days, the students met as a class and as entrymates to learn about Williams and each other. They posed for a class photo, took placement exams, learned how to navigate the library and course catalog and got to know their dormmates through a variety of special activities. Only after these first impressions were indelibly inscribed — and the wide world of Williams and fellow students opened up to them — did students break into groups based on interests. All in all, it is hard to find anything wrong with this change. One measure of the success of Williams as a community is the amount and quality of the interaction among its members, especially the members of a given class. Although, in scanning (both senses) through the yearbook, I am pleased at how many people I knew, at least a little, I am sad about how many people I did not know, how many classmates I never talked with or learned from. Much of this was, of course, my own fault. But much of it was a result of the social structure of the College. I would wager, with this small change, the college has greatly expanded the number of students that the average students “knows”. 1) Knows more of her classmates by name. 2) Is known by more of her classmates by name. 3) Reports higher satisfaction with college life. 4) Is less likely to take time off after freshmen year. Although the typical Williams student, at least 15 years ago, has a much better time of it than the typical Harvard student, at least 5 years ago, there is always room for improvement. It is heartening to see that the College in general and President Schapiro in particular recognize and act on this. You, too, can see your loved ones imortalized forever. Just send us an e-mail . . .
Oh, Dave. I take issue with the recent comments you make here and here regarding Williams’ “success” as an institution (which on one level, I imagine, is precisely the effect you seek). You are concerned about Williams measuring success “by ethnic box-checking.” However, you also consider “relative yield” to be a valid measure of Williams’ success. These are not compatible positions. complexity (but it’s a nice measure). If a diverse student body is a priori an asset in higher education, then it follows “ethnic box-checking” or whatever you want to call it logically will increase relative yield, given a rational market for college admissions — all other things being equal, entering freshmen will choose a diverse school over a non-diverse school, so that they can grow up to be better businesspeople, soldiers, or whatever. that the school is at reaching 100%, the higher ts relative yield, right?). But enough about that. I’m late for happy hour, and I really wanted to write so that I can claim my prize (see attached). The photo is somewhat out of date, but it’s the best I can do at the moment. Related to the below post is the question of how to measure Williams’ success as an institution. The most important measures are probably (hypothetical) comparisons between the effect that Williams has on its graduates, relative to the effect that other schools would have had. Like any non-experimental situation, this can never be estimated perfectly, but, conceptually at least, it is easy to think about. A high school senior, call her Michaela Kane, could (I wish) go to either Williams or school X. The test of Williams success is not that, after 4 years at Williams, Michaela is a better writer, clearer thinker, happier person, more comfortable with diversity or whatever than she was 4 years ago. The test is whether, by these or whatever metric you like, she is better off having gone to Williams than if she had gone to school X. The test is not Michaela before versus Michaela after. It is Williams Michaela versus non-Williams Michaela. Again, since Michaela can only go to one school, we can never know for sure what the outcome would have been had she made the other choice. So, our estimate of Williams’ success will always be an estimate. But this is the standard approach to all sorts of statistical problems in which randomized selection is not possible. Yet, this is not the measure of success that I want to mention in light of the WSJ article. There is a cruder measurer of success that one could use. It is relative yield. Now, Williams already measures “yield”, the proportion of students who choose to enroll out of the pool that has been accepted. A mroe direct measure of success, relative to a specific school, is the relative yield. That is, out of the pool of students who are accepted by both Williams and school X and who choose one or the other, what percentage choose Williams? I would wager that the relative yield of Williams as compared to Amherst and Swathmore is around 50% but that it is less than 20% for places higher up in the academic food chain like Harvard and Yale. Surely there is a reader out there who has a sense of what the real data is like. In any event, one way to measure the success of, for example, President Schapiro, is to look at the increase in Williams relative yield during his term in office. Note that this is far from a perfect measure. After all, Williams might switch resources from teaching to advertising, therefore making Michaela more likely to select it but less likely to learn a great deal. But it would be interesting, to say the least, to see these numbers and watch how they change over time. Selective universities justify favoring children of alumni and prospective donors on the grounds that tuition doesn’t cover the entire cost of education. These schools say private gifts subsidize scholarships, faculty salaries and other needs. Children of celebrities, they add, enhance an institution’s visibility. “I will certainly factor in a history of very significant giving to Stanford,” said Robin Mamlet, admissions dean. She added that the university’s development office each year provides her with names of applicants whose parents have been major donors. 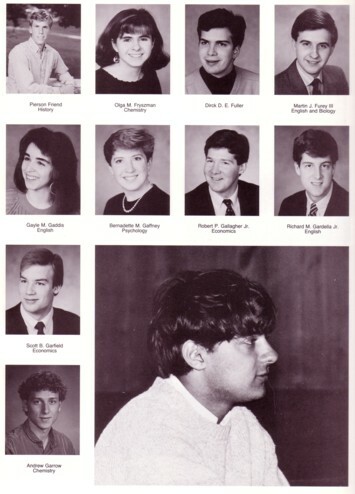 Ms. Bass was far from the only child of prominent parents in the Groton class of ’98. It included children of diplomats, international lawyers and famous writers, as well as other wealthy businesspeople. Harvard admitted a dozen members of the class — more than any other Ivy League university. At least five of those accepted by Harvard were alumni children, including Matthew Burr. His father, Boston venture capitalist Craig L. Burr, gave his alma mater between $1 million and $5 million in the mid-1990s, according to Harvard records. Craig Burr says his donation to Harvard had “absolutely nothing to do” with his son’s acceptance. “Matthew did not need any help because he had phenomenal grades,” he says. Harvard declines to comment on individual applicants. 1) Mr. Burr is, of course, wrong in his claim that Harvard doesn’t care about his past and future generosity. Of course, if it were my child, I would say the same thing to any WSJ reporter who called. The key clue is young Matthew’s rejection from Williams. The number of students rejected by Williams and accepted by Harvard is small. (If anyone knows, even ballpark, how big it is, please let us know.) The number of such students who don’t have a Harvard-specific hook, almost always active/generous/wealthy alumni connections, is almost certainly tiny. 2) A related point is that student preference for Harvard over Williams is probably a market failure in the sense that most students who go to Harvard (or Yale or Princeton or fancy research university X) would have been better off going to Williams (or Swathmore or Amherst or small liberal arts college Y). This is actually too broad a topic for this post, but, having known hundreds of Harvard undergraduates (my wife and I were “tutors”, essentially JA’s for upperclassmen, for 4 years at Harvard), I am pretty sure that it is true. The week in Illinois started with a 12 hour board meeting but things improved from there. The dogs did great, especially Penguin. Two years ago she shocked me and a lot of other people by winning 1st Award of Merit. Awards of merit are the judge’s way of recognizing the dogs who were in the running for Best of Breed right to the end. It’s usually only done at specialties where there are a lot of good dogs. 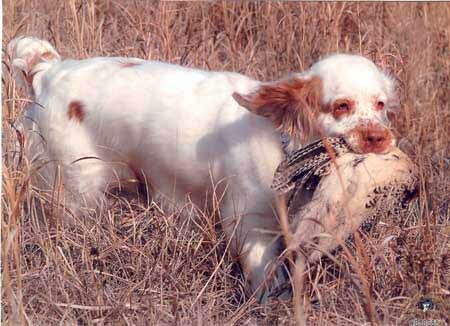 In our case, there were about 50 champions, a huge number to have in one place for our breed.) It was so amazing that I retired her and she had not shown in the US since then. I brought her back out this year because the judge is an elderly British gent who has forgotten more than I will ever know about the breed, a once in a lifetime chance. And then a miracle occurred….Penguin repeated as 1st AOM. She ended up ahead of her better-known sister who won Best of Breed at last year’s specialty. Too much information, I’m sure, but I’m a proud mom. Many people (you know who you are KK Roeder, Phil Culhane, Jocelyn Shadforth . . .) have promised to send updates on their activities. In the last week or so, almost no one has. So, all that is left are my random comments and too much politics. Have mercy and send material. There will be a debate tomorrow about affirmative action and college admissions at Williams. I sometimes think that it would be fun to live in Williamstown so that I might take in events like this. Then I realize, Duh!, I have two small children. I don’t do evening events. My own preferred solution to the issue is not so much to practice affirmative action at places like Williams or to make it illegal to do so (my betting on how the Supreme Court will decide). My preference (thinking as either a college administrator or as a federal regulator) would be to make it illegal and/or unseemly to count by race or ethnicity. The federal goverment certainly has no business asking my daughters what “race” they are. And Williams, as a private institution, should be able to let in whoever they want, but they shouldn’t be able to quiz people about their background or to publish statistics on what percentage of the student body is this, that or the other category. Perhaps the best parallel would be religious background. No one knows (I think) what percentage of Williams students are Baptist or Catholic or Jewish or whatever. The College would probably think it unseemly to even ask such a question. Why should they care? Of course, an applicant whose life is centered around her Baptist faith might very well discuss this on her application and, to the extent that the College feels (correctly) that having a mix of religious and non-religious students at Williams improves everyone’s education, she might benefit in the application process from this. That is, there is nothing wrong with the College accepting a very religious Baptist over someone with slightly better high school grades and recommendations and standardized test scores for the sake of improving everyone else’s education. The Boston Globe reported that Williams ranked second among national liberal arts colleges in percent of black students in the first-year class and in black student graduation rate. The Boston Globe reported that Williams College was ranked second, after Amherst College, in the Journal of Blacks in Higher Education rankings of 24 selective institutions. The rankings looked at the percentage of African-Americans within the student body and the graduation rate of these students. I worry that the college playing a numbers game. Maybe Williams has the highest proportion of German/Irish/Jewish/insert-your-favorite-group-here students of any school in the country. Maybe it has the lowest. The critical issue is the quality of the education that the students who are there receive. I find it hard to believe that that quality can be measured by ethnic box checking. From the system that we knew (freshmen pick with small groups, go to a house and, pretty much, stay there for the next 3 years), the college has moved to a campus wide lottery, based on class year. Every student/group gets a number. The worst off rising senior is higher on the list than the best off rising junior and so on. For the most part, the seniors pick the row houses and other desirable rooms. The juniors all live in Grelock, and the sophomore all live in Mission. This page seems to provide a current overview but these links (see this example) are sometime quite out of date. Although I sometimes feel that many changes at Williams since our departure have been for the worse, this strange strikes me as a great idea. 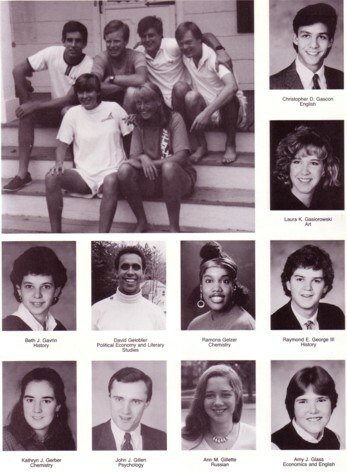 Although there were a lot of fun and interesting people in Carter House, where I lived for three years, I would have preferred to have known more members of our class, rather than the many ’86, ’87, ’89 and ’90 ephs that passed through Carter with me. I would wager that this simple change has done more to change intra-class dynamics on a whole range of issues than instigators of the housing lottery might have predicted. I would bet that a lot more students from the same class go on to have deeper and longer lasting relationships after Williams. There are probably more intra-class marriages (not that there is anything wrong with marrying someone from a different class! ), more graduates rooming together after college, more identification with both the class and, I’d guess, with the college. There is probably a great senior thesis (in anything from economics to political science to sociology) to written about this. An economist (read: Morty Schapiro) might view this as an excellent “natural experiment.” Consider the differences between the classes just before this new system went into a effect (I think it was just a couple of years after we graduated) and just after. I would bet that graduates under the new system feel more connected to their class (and therefore to Williams) than prior graduates do. I bet that they give more money, write to their class secretary more often, visit Williamstown more regularly and otherwise demonstrate a deeper connection to the College. To my mind, this is all to the good. Update: This seems to be a better description of the actual process, but is even more out of date (classes of 2000-2002!). was taken in a wonderful spot — Cary Benedict Collins’ family home in Bay Head, NJ. Had some memorable road trips to the Jersey Shore both in the summer and off-season, a few times during the break between Winter Study and second semester. The next page in our oddessey (It’s true: There is no spell checker on Blogger.) 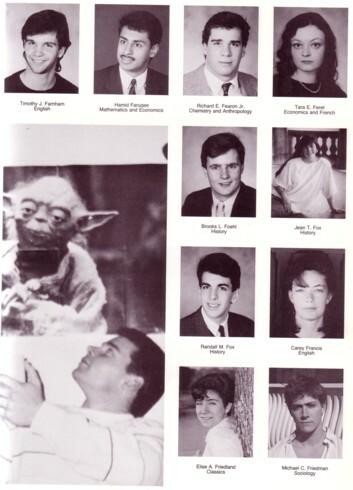 through the 1988 yearbook. No points for identifying these seniors, but the location of the picture is a mystery to me . . . It has been at least a month since I dropped in on the blog. It is regularly illustrated now! Very nice. I suspect that it was Mark Solan who ratted me out on the crossword thing. As one might expect, he quiched out at the last minute. In any event, I am please with my ranking of 113, as speed-solving crosswords has never really been my thing. On the subject of puzzles, though, perhaps you can help me answer this question: Is it our own Scott Purdy ’88 who placed fourth — trouncing me — in the 2001 US Puzzle Open? Can anyone help confirm George’s speculation?? Here is the next page from our yearbook. Although many of us have suffered from the passage of time, it is good to see that Yoda seems as spry as always. Note that there has been a dramatic drop in the number of e-mails that we have received with links, comments, suggestions and so on. Remember: This is your blog. Without continuous input for our faithful readers, we will attrophy away to nothingness. Interestingly enough, we still seem to have a steady audience, although these numbers do need to be read with a grain of salt. If nobody else has answered this question, the person Jody could not identify in that picture with Kathy Wolf — between Debbie Zalesne and Ellen Lee — is Carey Francis. What do I win? 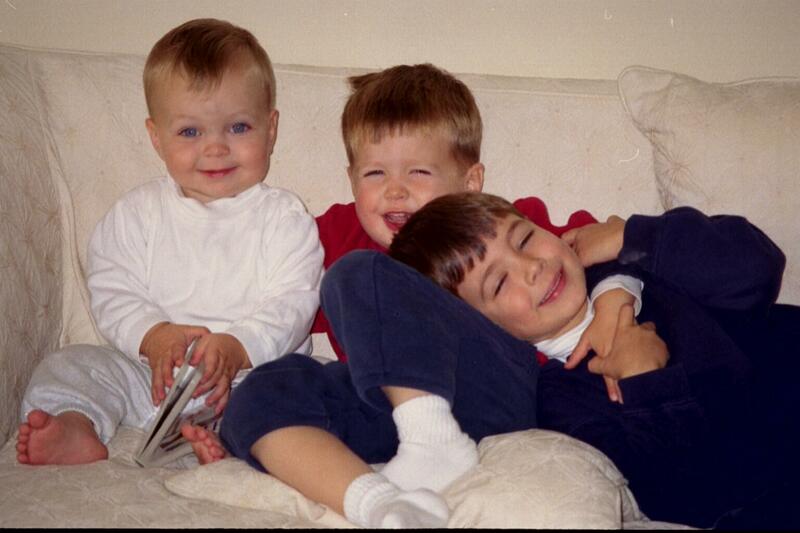 George wins free display of a picture of his lovely wife and charming children on this blog. Just send it in George! Since returning to Williams, Johnson found himself rarely missing Whit Stoddard’s annual welcome lecture to first-year students, “A Sense of Where You Are” or his farewell to the seniors, “A Sense of Where You Were.” According to Johnson, “Whit’s dialogue on the campus, its buildings and its history, never failed to be as fresh, insightful and entertaining as if it were the first time he had spoken on the subject.” Realizing the treasure that Whit’s knowledge and perspective were, Johnson began bothering Stoddard on a regular basis about getting to work on a book that would be, in effect, a walking tour of the campus. I am not sure where Johnson is now, but I am doing my best to track down a copy of the book. The latest edition of the Williams Record is online. Highlights include an article on the men’s basketball victory in NCAA Division III and word that tuition has been raised to, gulp, over $35,000 per year. I am no mathematician, but, at this rate of growth, Williams will cost around $200,000 for four years by the time that our children are ready to go. I have two daughters so . . . I think that I need to work harder. Whitney loved Williams, from which he had graduated in 1935. But that love was not blind. He delighted in pointing out its weaknesses, sometimes with an earthiness intended for a select audience of colleagues. Puffery drew his scorn, and the bureaucracy created in the years before his retirement a wry sense of outrage. In his final address at a faculty meeting, he did an iconographic analysis of Hopkins Hall, the administration building (in its state before the addition was built). He noted that projections from the building marked the offices of the president and the dean of the College. The Dean of Faculty and Provost, however, lacked an appropriate projection on the southeast corner, where they had their quarters. He proposed to honor them with a tall chimney to carry the smoke created by burning all the new paper work they had mandated. I guess that it is good news that Williams won the mens NCAA Divsion III basketball championship last month. I am certainly happy to extend congratulations to all concerned. But, am I the only one who finds the Williams athletic web page a little, uh, excessive. Don’t get me wrong (please). I am pro-sports, pro-Williams and pro-athletes at Williams. I think one of the things that makes Williams special is that it is the sort of place at which you can do both sports and academics seriously. Indeed, I thought that it was a bad decision for Preident Payne not to let the womens lacrosse team particpate in the NCAA play-offs a few years ago because of a conflict with exams. Yet, seeing how Williams has dominated the Sears Directors’ Cup (awarded for overall athletic excellence) both historically and this year makes me worried. As long as the amazing varsity athletes that we have are similar to the rest of the student body (in terms of academic qualifications prior to Williams and academic success at Williams), then I have no problems. Indeed, I would think that it is wonderful that Williams is able to attract such well-rounded individuals. But, is this really true? Is it likely that so many of the best athletes in the country are also among the best students? I wonder . . .
Of course, the last thing that I want to be is biased against athletes. Indeed, the fellows that I played with on the squash team were as academically gifted as a random selection of other students. And, to the extent others besides me are worried about this, the college has the numbers to set our minds at ease. What, for example, were the average high school grades or SAT scores or class rank of Williams varsity athletes versus non-athletes? What are the Williams GPA differences, if any? I like to hope that my concerns are groundless, but Williams would not be the first school to become overly enamored of success on the playing field . . .
Here’s the next page from the yearbook. As always, comments and updates are welcome. EphBlog is powered by WordPress and delivered to you in 1.652 seconds using 25 queries..